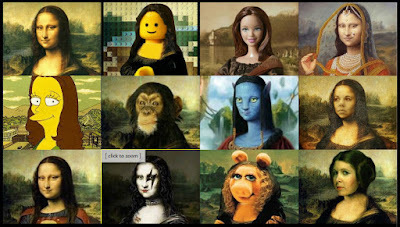 I have been running across a lot of Mona Lisa parodies on Pinterest lately. I cannot help myself from giggling every time I run across a new one. Here are some of my favorites! I am going to use them this year when I teach the Modern Mona Lisa lesson. Have you seen that lesson? It's a fun one! I showed Mona parodies to my kids at the beginning of the school year when we talked about sketchbooks and Leo D. They loved it so much!! I searched for a long time for just the right ones. I love all the funnies you found!! I love showing my students parodies of Mona Lisa. They get such a kick out of it. Something else that I find shocks my students is showing them a picture of what the Mona Lisa looks like in the Louvre. They can't believe how small it is. I love sharing shocking and exciting information with my students. Thanks for all your great posts! For those of you who know me....can you see the Mona that's me?